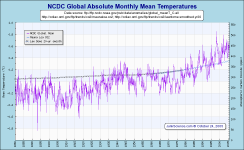 The world's temperature is a difficult metric to capture. After all, there is no convenient 'magical site' to sample that will give us the answer we seek and, by the time we have sampled and collated sufficient data points to try to work it out, that isn't the temperature any more. 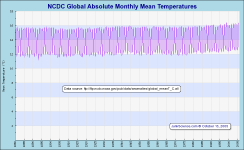 We can, of course, sample enough sites to garner an indication, as does our near real-time global thermometer at right NOTE THAT THE GLOBAL MEAN 'THERMOMETER' HAS BEEN TERMINATED DUE TO CONTINUED ACCESS ISSUES WITH METAR -- SADLY MISSED. Read more... New daily "thermometer" above the latest "official numbers". Click on the graphic or here for the new daily mean temperature page and here for the introduction. 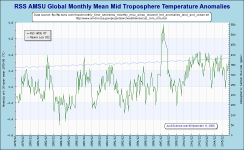 By request here is the 'spaghetti plot' of multiple mainstream global temperature time series. We tend to find such plots too cluttered to be of great value but certainly this demonstrates the increasing divergence between lower troposphere and near-surface plots (the two low series are UAH and RSS MSU series, in the 'middle' is the combined Hadley Centre and UEA's Climatic Research Unit effort while the high series are GISTEMP and it's near-clone, NCDC). 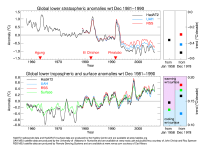 There has been some discussion whether we should plot both GISTEMP and NCDC given the highly incestuous nature of the data and its processing but the bottom line is that all near-surface time series rely on basically the same recording points and only the processing differs, if at all. Similarly, there is a very limited supply of MSU tropospheric data available and only the processing differs there, too. In essence what we have are two near-surface series, the constantly up-revised combined output of GISS and NCDC and the much less excitable joint effort by HadCRU, plus the tropospheric series derived using differing processing by UAH & RSS but producing virtually identical results. 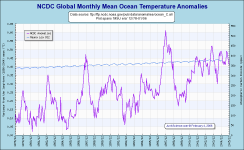 One thing most seem to agree on is the abrupt warming spike caused by the 1997/98 El Niño event. Update: A number of users have requested we omit NCDC and RSS since they essentially only clutter the plot without adding any useful information. We have agreed to do so. As an alert, we will be generating anomalies when the December data have been processed to be based on the 30-year mean annual cycle of 1981-2010 to match the 30-year normal time frame of many meteorology anomalies. This will replace the older reference annual cycle of 20-years (1979-1998). 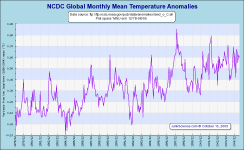 Preliminary runs show that the new mean annual cycle will be about 0.1 C warmer each month for the global averages, meaning all monthly anomalies will appear to decrease by about 0.1 when the new 30-year base period is used (see below). 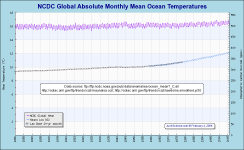 Information from Global Hydrology and Climate Center, University of Alabama - Huntsville, USA The data from which the graphs are derived can be downloaded here. UAH MSU mid troposphere data do not vary significantly from the lower troposphere set. These are provided solely because Remote Sensing Systems are highly erratic with regard to making their lower troposphere data available and a number of site users specifically wish to compare UAH & RSS MSU data. 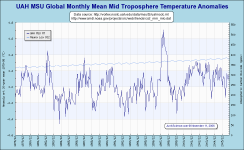 is in much better agreement with other sources of tropospheric temperature. We apologize for any inconvenience. 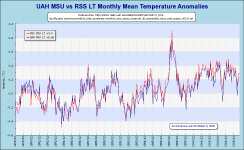 Last January, I made a small change in the way TLT is calculated that reduced the absolute Temperatures by 0.1K. But I only used the new method for 2007 (the error). When the data are merged with MSU, MSU and AMSU are forced to be as close as possible to each other over the 1999-2004 period of overlap. This caused the error to show up as a downward jump in January 2007. To fix the problem, I reprocessed the 1998-2006 AMSU data using the new code (like I should have done in the first place), and merged it with the MSU data. We would like to thank John Christy and Roy Spencer, who were very helpful during the diagnosis process. 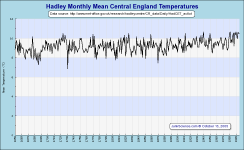 Hadley Centre graphic, updated irregularly. Hadley Centre graphic, updated near-realtime. Please note that Hadley graphics are subject to Crown Copyright. Their availability is entirely at the discretion of the owning entity. IMPORTANT NOTE May 16, 2008: It has been brought to our attention that NCDC have switched mean base periods from 1961-90 to 1901-2000. 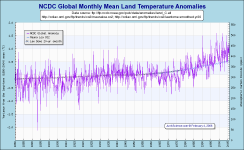 This has no effect on absolute temperature time series with the exception of land based temperatures. 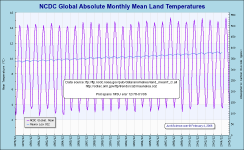 The new mean temperature base is unchanged other than land based mean temperatures for December, January and February (the northern hemisphere winter), with each of these months having their historical mean raise 0.1 K.
At this time raising northern winter land based temperatures has not altered published combined annual means but we anticipate this will change and the world will get warmer again (at least on paper, which appears to be about the only place that is true). *In February, 2006 NCDC transitioned to the use of an improved Global Land and Ocean data set (Smith and Reynolds analysis (2005)) which incorporates new algorithms that better account for factors such as changes in spatial coverage and evolving observing methods. 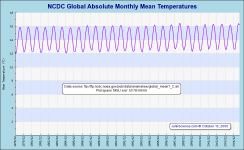 (See NCDC Global Surface Temperature Anomalies) The same file states "The global monthly surface temperature averages in the table below can be added to a given month's anomaly (departure from the 1880 to 2004 base period average) to obtain an absolute estimate of surface temperature for that month." 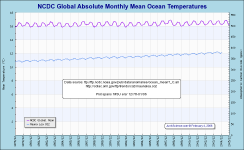 Which is precisely what we are doing with the global combined, global land and global ocean anomalies to derive the following, revised global absolute temperatures. Note from NCDC: *From February 2006 through April 14, 2006, the anomalies provided from the links below were inadvertently provided as departures from the 1961-1990 average. 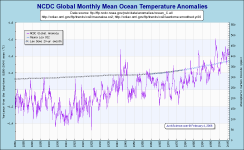 Anomalies are now provided as departures from the 20th century average (1901-2000). 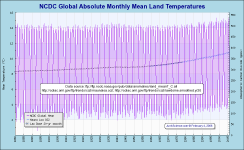 Note that the following table differs from NCDC's "Global Mean Monthly Surface Temperature Estimates" published here because those numbers are for the Base Period 1880 to 2004. We realise having everyone declare anomalies with reference to different base-periods is frustrating and we try to maintain at least similar base reference periods for data used in the graphs. 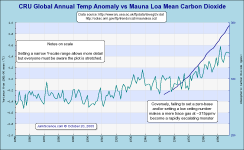 Where discrepancies are observed in reported anomalies check the reference period. 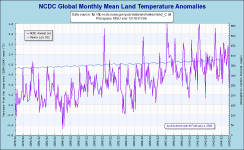 UPDATE February 12, 2006: Curiously, the revised monthly means for 1961-90 are exactly the same as those published for 1880-2004, though somehow we doubt that will lead to a rash of headlines stating that the world is really kind of average, temperature-wise. 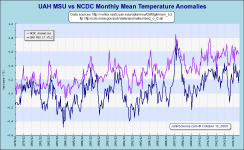 Despite their prodigious effort, for which they have our thanks and admiration, NCDC are still producing near-surface temperature amalgams, which we view with some suspicion. Not because of anything NCDC are or are not doing, after all, they are simply providing the service people demand and doing so to the best of their ability, merely because near-surface amalgams are subject to so many potentially corrupting influences. For example, recording points may be established at the edge of town and over time be surrounded by multi-story buildings and paved roads - it's progress and who's to complain but it does add significant local warming bias to many records over time. For this reason we compare near-surface anomalies with those suggested but the satellite-mounted MSUs. NCDC's reported anomaly should agree with these figures (from their web page). The land-based trend is 75% greater than land + sea surface trend and 40% greater than the Hadley-CRU cooperative merged land and sea surface trend. This brings us to the hottest of records. 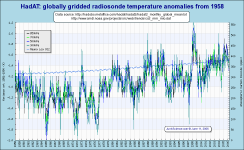 Not that we think the Goddard Institute for Space Studies team are particularly good at establishing global temperature or anomalies, at least no better than other industrious teams attempting to do the same thing, it's just that GISS's GISTEMP is consistently delivering the warmest anomalies and accelerating away from the pack (well it is the house of Hansen, so-called "father of global warming" ...). 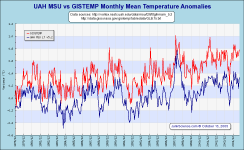 September 2006: from the next available update GISTEMP + dSST will be the source for these graphics -- this might help to reduce the apparent disparity between datasets. 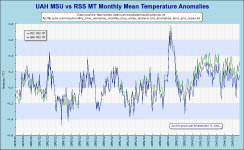 Dataset Creep: As some of our more observant readers have noticed, the derived mean temperature for any given month is subject to change, with revision of derived temperature values possible, even likely, years after publication. While such dataset creep makes little difference in the grand scheme of things it does disturb some people's confidence in both the datasets and the displayed graphics. This is unfortunate although we can understand it when anomalies are given to three decimal precision and then adjusted tenths of a degree after the fact, so to speak. Why does it happen? Usually because delayed or absent station reports become available, some of which appear to have significant effect on apparent anomalies. Does it matter much? Not really, it just adds to the little we currently know of our planet and its temperature trends. 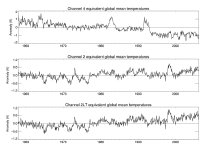 We do not know with any precision what the actual mean temperature of the planet is at any given time and most of the figures given here are various guesstimations of the 'anomaly' (variation from estimated mean for the time of year over some period of the very recent past, commonly 1951-1980 but not always). 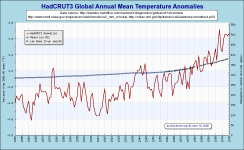 Sadly, such constant revision does not make it any easier to counter allegations that simply talking about 'global warming' is making recent decades hotter. It occurs to us that the Central England Temperature set makes a good proxy for the northern hemisphere and examination of the plot drawn from Jones, P.D. and M.E. Mann. 2004. Climate Over Past Millennia suggest this is indeed the case. 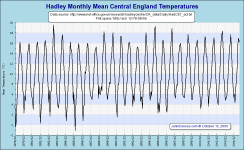 The Central England set suggests the northern hemisphere reached contemporary references temperatures in the 1940s (as shown by the NH HadCRUT2v track used by Jones and Mann) and likely did so in the 1830s and 1720s as well. Why do we mention this? Well, it certainly appears startlingly at odds with a rather more notorious northern hemisphere temperature graphic, doesn't it? 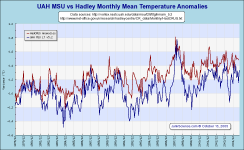 Whether the CET with its focus on the industrial heartland of England has been adequately adjusted for Urban Heat Island as claimed is a question frequently asked of us. The short answer is, of course, we don't know. This is something of a black box and the only one who can tell us, Phil Jones, has been rather reluctant to share raw data and methodology. Consequently it is necessary to second guess the situation and the only help we can find is the long-term air temperature series from Armagh Observatory, Northern Ireland. 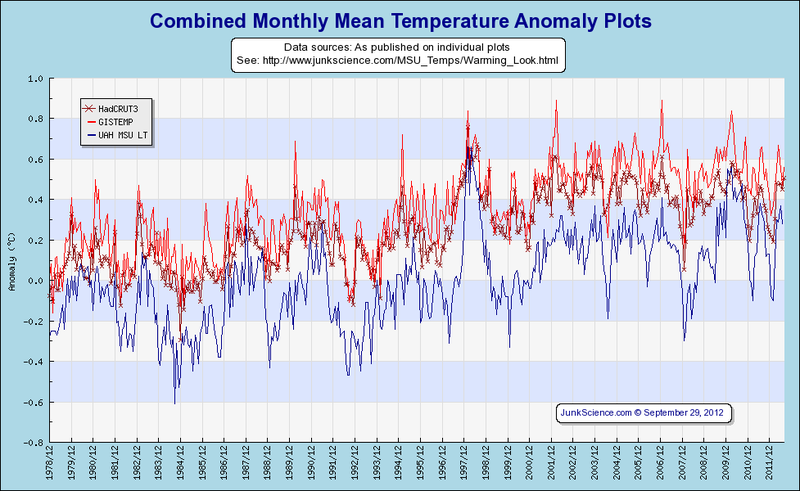 Below we have the Armagh Max, Min and Mean annual temperatures and the annual mean plotted with the CET absolute mean temperatures for the corresponding period. February 2006: Drought in England: Interesting that the drought of note (1976) should have occurred at the end of the period of cooling that caused such global angst. Let's have a look at this before the, uh, deluge of claims of 'global warming'-induced drought. The England and Wales Precipitation data is available online here. Those who like to check under the hood and kick the tires will find a tiny increase in precipitation over the 240-year record, with an interesting smoothing of precipitation through the year - that is, there's been a little more rain in the drier December through May half and a little less in the soggier June through November half of the year. Sounds like good news for water managers in England and Wales. 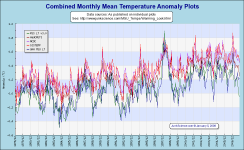 As can be seen in the adjacent pair of graphics there is virtually no trend in Armagh Summer or Winter maximum temperatures and a very small 'less colding' trend in minimum temperatures. Spring and Autumn in Armagh would appear to have softened somewhat with Summer lingering a little longer and perhaps Winter departing a tad earlier. 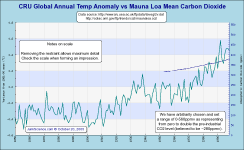 More 'less colding' is evident than increase in maximum temperatures. Readers should note that there is a longer, combined record for Armagh extending the record back to 1796, which we have been granted permission to publish here. One important feature of the longer series is that temperatures pre-1825 average -0.75 °C cooler than the Central England Temperature, although from 1840-2004 the difference averages a much smaller -0.23 °C. The effect of this pre-1825 divergence in the records is that the longer Armagh series has a trend of +0.057 °C/decade compared with the 1844-2004 trend of +0.036 °C/decade. Again we remind everyone that trends are heavily dependent on selection of origin and listed anomalies depend on reference period - always check for data compatibility before comparing. 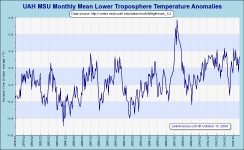 From Air Temperatures At Armagh Observatory, Northern Ireland, From 1796 To 2002: Long-term trends are seen in both seasonal and annual mean temperatures, with spring and summer series relatively flat compared with autumn and winter. Prior to 1820 we note that autumns and winters were cooler by ~1 °C. Later, we note a significant warming in the mid-19th century, which started in the late 1820s and continued till c. 1870. A cool interval at the end of the 19th century was followed by a period of rising mean temperatures that lasted till the mid-20th century. 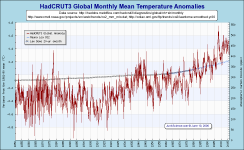 Finally, a slight cooling from 1960 to 1980 was followed by a gradual warming over the past two decades. In spite of the current warmer conditions, annual mean temperatures still remain within the range seen in the previous two centuries. In addition to air temperature data we have Armagh Observatory rainfall data. From Precipitation at Armagh Observatory 1838-1997: "We note a roughly constant upward trend, with a slope of +0.0039 ±0.001mm/day/yr, in annual precipitation from the beginning of the series until approximately 1960. The only really significant departure from this trend is the dip in rainfall around 1890 close to, but possibly a little later than, a dip in mean air temperature. The generally upward trend in both mean air temperature and rainfall over the period 1890–1950 could be explained by the increased evaporation rate over the Atlantic as air temperature rises. A similar explanation would presumably be viable for the dip in temperature and precipitation around 1890. Between 1850 and 1880 the approximate correspondence between precipitation and temperature breaks down, with temperature around 1850 higher and rainfall lower than average. After 1970 the precipitation drops significantly and thereafter remains roughly at the level recorded at the beginning of the series." The correlation between temperature and daily mean precipitation would appear rather poor. There is a noticeable change in winter precipitation with winter rainfall increasing through the 19th Century portion of the record, then remaining largely constant through the 20th Century despite a rise and fall in the first half. It is particularly remarkable that rainfall driven by the Westerly Maritime Stream from the Atlantic has not risen markedly since the 1970s despite the belief global warming has been dramatic during this period and the expectation of increased oceanic evaporation and associated precipitation that should accompany such warming. Very significant variations in storminess have been recorded over the last 200 years for Armagh observatory despite the sheltered inland nature of the site. This includes evidence for increased storminess at the end of the Little Ice Age. However, there is no evidence of increased storminess over the last 30 years. When similar records from other Irish stations are examined, there is some evidence of a possible northwards movement of the storm tracks that have affected the island of Ireland over the last 30 years. So, that little lot should have Earth's temperature sorted eh? Actually not. There are many ways of trying to determine the planet's temperature, although the efficacy of such a metric has yet to be established. So far we've had a look at a few global and regional splits but there are others. 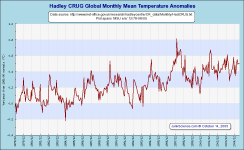 Take, for example, those available from HadleyCRUG, a collaboration between the UK Met Office Hadley Centre and the Climatic Research Unit - similar to but not the same as either. 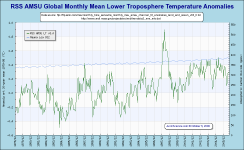 Following we have a few dozen more ways of looking at the planet's temperature. Just before we leave you with this fascinating array of measures, and fascinating they must be because people have discussed weather and ambient temperature for time immemorial, might we just pose the questions: what is the 'correct' temperature and what difference does it really make? After all, we have always made the best of whatever the temperature happens to be - and so we always will. 'Soft' weather is a novelty we have always enjoyed and adverse events something we have always endured - so what's new? Whatever, here's a selection of metrics from HadCRUT2 -- series no longer continued in this format from end 2005, left for those who like to refer back to previous versions. Some regional splits are available in HadCRUT3 -- see this page. Russian Research Institute for Hydrometeorological Information-World Data Center (RIHMI-WDC). Annual temperature deviation from the 15 year average of 1961-1975. This will vary slightly against the global mean sea level figure but, with such a well-mixed trace gas, the differences are trivial. Original source. PLEASE NOTE: These time series graphics are produced with first publication of the month's data from MLO, which is provisional and regularly altered in retrospect. It is common for adjustments to be made throughout the series without notice. These graphics therefore are only certified correct with the data available at first change capture in the month and values may change ± 2 ppmv (sometimes more) in subsequent renderings. 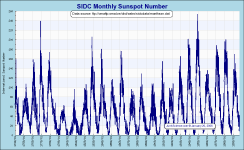 ABSTRACT (Lean 2000): Because of the dependence of the Sun's irradiance on solar activity, reductions from contemporary levels are expected during the seventeenth century Maunder Minimum. New reconstructions of spectral irradiance are developed since 1600 with absolute scales traceable to space-based observations. The long-term variations track the envelope of group sunspot numbers and have amplitudes consistent with the range of Ca II brightness in Sun-like stars. Estimated increases since 1675 are 0.7%, 0.2% and 0.07% in broad ultraviolet, visible/near infrared and infrared spectral bands, with a total irradiance increase of 0.2%. There you have it, each graph produced from the best available data (the same data) but all visually distinctive. The first candidate, although lacking the amplitude to allow easy detail examination, is perhaps the most visually accurate and least useful. 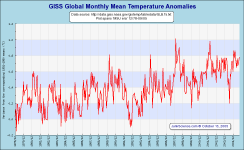 Clearly global temperature has been on an overall warming trend through the series and this warming is very small compared with say, seasonal variation. 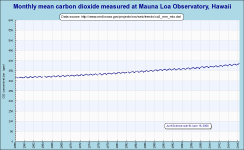 Likewise, the two order of magnitude magnification of carbon dioxide (by scaling parts per million on a 10K range) has made our trace gas visible while maintaining perspective (two times a tiny fraction of the atmosphere still gives you a tiny fraction of the atmosphere). Our next graphic is a mixed bag, rather restrained in the temperature variation when compared with most publications but sufficient to readily observe variation. The representation of rapidly climbing carbon dioxide is achieved by scaling against only a tiny portion of the valid range. 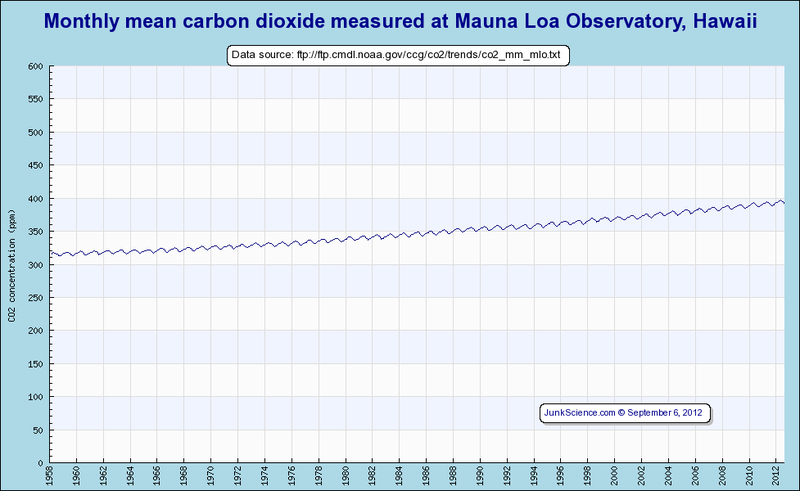 ACIA, in this graphic, manage to present virtually a perpendicular change which gives the impression of being about 500% over 'background' levels and fitted neatly to a representation of the infamous 'hockey stick' graph when in fact the total change in atmospheric carbon dioxide is under 35%. Oh well, that's the impression they want to give, we suppose, although we think it an appalling piece of chart work. 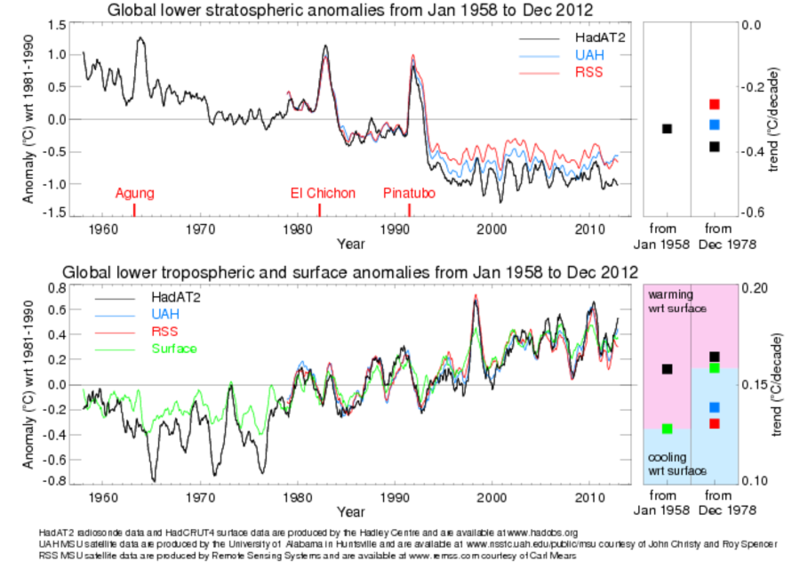 Finally, our third chart depicts unrestrained temperature variation, utilising maximum plot space in order to easily depict temperature changes (albeit vastly magnified) and with a greatly magnified but proportionately correct trace gas representation (316-377ppmv annual CO2 (Keeling and Whorf, May, 2005), missing values omitted). This is our preferred graphic and the style we present. Granted, it greatly amplifies apparent temperature change and, if this worries readers just visualise the world as a relatively flat 14 °C ± 0.7 °C and you'll be in the ballpark. 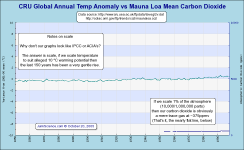 Copyright © 2004-2011 JunkScience.com - All Rights Reserved.